There was no prospect of a festive truce for the Volvo Ocean Race teams on Sunday as CAMPER with Emirates Team New Zealand battled to hold on to their lead in the face of a Christmas Day fightback from Team Telefónica. The five boats still sailing in Leg 2 from Cape Town to Abu Dhabi were entering the final phase of the first stage to a secret safe haven in the Indian Ocean. CAMPER, who had a lead of just under 24 nautical miles on Saturday at 1300 UTC, saw that advantage down to less than four nautical miles by 1300 UTC on Christmas Day, with the prospect of the high-stakes fight continuing all the way to the finish line. "We've just got to keep the hammer down," said CAMPER's Australian skipper Chris Nicholson. "There's plenty of racing left in this leg." Team Telefónica have a three-point lead in the overall standings after finishing ahead of CAMPER in both the first offshore leg from Alicante to Cape Town and the V&A Waterfront In-Port Race in the South African city. With 24 points on offer for first place in this section, and 20 for second, CAMPER would replace their rivals at the top of the leaderboard if they can hold on to their advantage. Leg 2 will be completed with a sprint into Abu Dhabi, once the boats have been shipped from the safe haven to a point off the Sharjah coastline. Groupama sailing team, who led for much of the leg only to slip back in the Doldrums, also managed to claw some miles back from CAMPER on Sunday, closing to within 59 nautical miles of the leaders, though skipper Franck Cammas, like many of the family men in the six crews, had part of his mind on absent loved ones. "We've been maneuvering, navigating, doing everything in our power to go as quick as we can to our final destination," said Cammas. "We haven't seen Santa Claus on our boat yet. Unfortunately I can't be with my girls in person so I guess I'll just have to do that telepathically with my thoughts. It's fine. I'm going to celebrate Christmas when I see them." In fourth place, 58.1 nautical miles behind the leaders, PUMA Ocean Racing powered by BERG, were given a rough introduction to Christmas Day. "Almost exactly at midnight we had a ripping 40 knot squall coming through and knock our socks off," Read said. "That was our Christmas present, our welcome to Christmas moment on Mar Mostro. “But everyone on board is healthy, happy and spirits are great. We're really looking forward to celebrating with our families but in the mean time this is our Christmas, with our family on the boat." Abu Dhabi Ocean Racing, back in fifth place, also had a hectic start to Christmas Day. 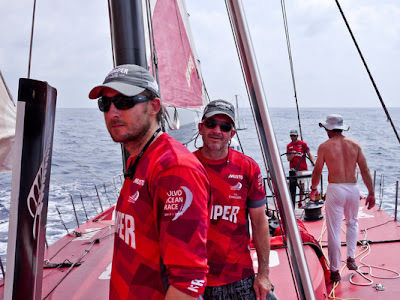 While the boats at the front were moving at speeds around nine knots, Ian Walker's crew were averaging more than twice that. "We had an absolute thrashing this morning," Walker said. 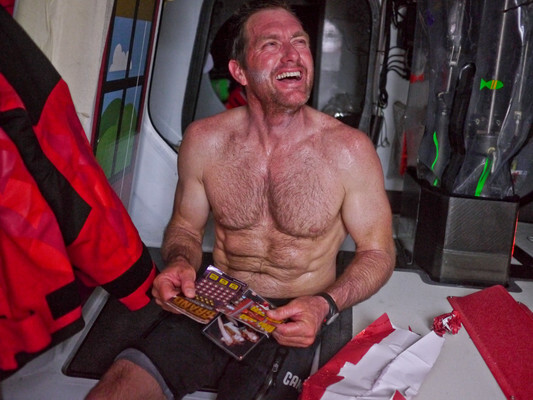 "We got 40 knots of wind and torrential rain for five hours." The conditions proved too much for the Christmas treats on board, according to Media Crew Member Nick Dana. “As the morning got on, so did the breeze," Dana explained. "At one point we were seeing a steady 35+ knots of true wind speed -- nothing too crazy, but with the sea state it made for tough driving conditions. Team Sanya's boat is currently out of the running as it awaits repairs on the island of Madagascar, with the team concentrating on getting everything repaired for Leg 3 to their home port in China.